Tour dates: 2 - 15 September 2009. My flight arrived in Lisbon at 22:00, and it took another hour to reach my hotel via the Aero Bus to the Rossio train station. My hotel was in the Bairro Alto, which, true to its name, must be climbed on a very steep road with the Elevador da Glória tram. The tram is only a single car that looks almost triangular due to the steep incline. I had very little time for sightseeing, but the narrow cobblestoned streets of Bairro Alto lined with old but unassuming low buildings made me look forward to the end of my trip when I'd have more time to explore. Even on a Wednesday evening after 23:00, the many street cafes were crowded with people. In the morning, I descended from Bairro Alto, took the metro to the main express bus station near the zoo, and got on a bus to Caldas da Rainha. The ride is moderately interesting, my main observation was how few trees there are in this part of Portugal. 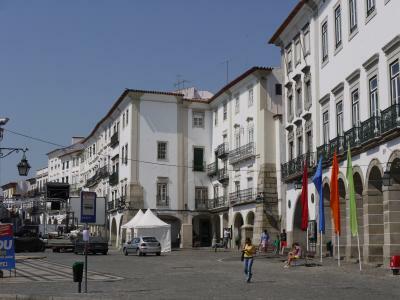 Caldas da Rainha is an interesting little town and I spent an hour there, and found a little farmer's market. From there I got on a local bus to Óbidos, where I had reserved a room at the Óbido Sol hotel the day before. My Garmin GPS receiver failed me here - it put the address in another village four kilometers away, but I ignored it and found the hotel right at the main street of Óbidos. Óbidos crests a long and narrow low hill in Portugal's Estremadura district. Its city wall is still intact and can be walked. On the highest point at the west end of the wall is a fort, now a luxury hotel, and the main church. 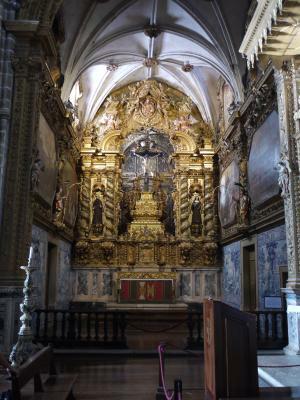 (Óbidos, being in a deeply catholic country, of course has several more churches.) At the opposite end, there is a viewtower. All the buildings inside the walls are perfectly preserved; most have only one or two floors. All streets are narrow and cobblestoned, running the length of the city and rising to the crest of the hill at the south side. There are almost no cars. It's very quiet. Outside the city wall, there are only a few more buildings; from the top of the wall one can see the surrounding countryside, farm land, hills, other villages, and, unfortunately, a freeway. There is a footpath outside the wall with some resting areas, where I am writing this. 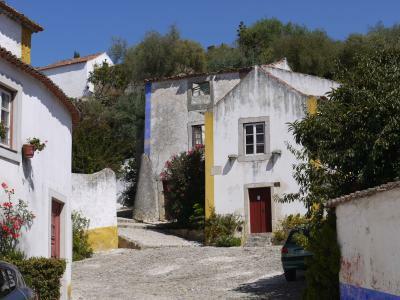 All the colors seem bright in Óbidos: the deep blue sky, the bright white walls of the buildings with yellow or blue trim, the orange roofs and a few green trees at the wall, and the red and purple explosions of bougainvillea bushes. There is not a cloud in the sky, and the sun casts hard shadows. No pastels here, it looks exactly as an old Portuguese town is supposed to look like. And I haven't found a WLAN yet. In front of one of the churches, a student orchestra is playing classical music, Yesterday, and Frère Jacques, endearingly getting most of the notes right. Missed the main specialty of Óbidos, tiny cups made of homemade chocolate, filled with liquor. The town falls asleep at about 20:00. 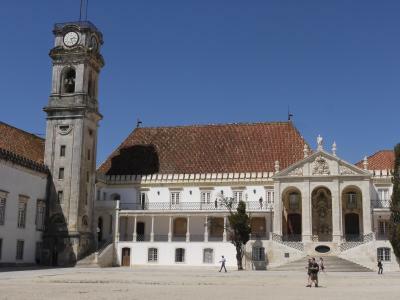 Took a taxi to Caldas da Rainha, and then a bus to Leiria, a major express bus hub, and then to Coimbra. This whole long-distance bus thing is kind of new to me. Earlier this year, in Asia, I'd look at the schedule and find a way to break the usual 18-hour bus ride into two segments so I could stretch my legs, and sometimes I wouldn't. In Portugal, your typical bus ride takes an hour. You barely sit down and open a book, and you are at your destination. And the buses are modern, silent, and comfortable, and nobody tries to squeeze nine people into the last row. Travelling in Portugal is for pampered wimps, really. The weather was rainy in the morning but quickly changed to a Portuguese sky without any clouds. Coimbra's main attraction is its university, a large complex that covers an entire hill and half of Coimbra's historical downtown. Most of it was built in the 16th to 18th centuries, and it includes several churches. The best way to reach it is climbing the stairs starting at the Moorish Arco de Almedina gate, leading to the Sé Velha cathedral built in the 12th century. A short hall leads from the church to a beautiful and peaceful garden framed by gothic arcades. A little past Sé Velha is Sé Nova, the new cathedral, built in the 17th century, facing a large square framed by university buildings. One of them houses the Museu Nacional Machado de Castro, across a large courtyard with a good view of the town. The museum is under construction, but two vaulted basement floors were already open. The main attractions are the ancient vaults themselves; they were built by the Romans in the first century AD and are quite large. Being on a hilltop, the "basement" floors actually have a few windows to the outside. North of Sé Nova is the Elevador do Mercado, a cross between a tram and an elevator, descending at a steep 45 degree angle to a station near the base of the hill, where a vertical elevator goes down the remaining distance. Trouble is, I was at the top and tickets are available only at the bottom. The conductor (who wears a badge that says Vigilante) let me in anyway and pointed me to the ticket office to buy a return ticket. Naturally I expected a ticket vending machine, but there is no ticket vending machine. Instead you take a number, and wait until it's called up and you can proceed to an agent. She will cleverly sell only three-ride tickets, a charmingly transparent maneuver to rip off tourists. It's called Elevador de Mercado because it leads to a large covered market building with two floors. In the first hall, fish is sold, and it's sealed off from the rest of the building by double doors. Everything looks clean, but unlike Tokyo's Tsujiki fish market, which is gigantic but has no smell whatsoever, this one reeks. The remainder mostly sells fruit, vegetables, meat, and pastries, and is not very interesting. I did buy a selection of pastries, among them a cream-filled egg tart that I had tried a few months earlier in the Portuguese part of Macau; Coimbra's version is smaller but better, less sweet and less sticky. Back at the top of the Elevador, where I left the remaining ticket stuck at the door, I looped around the university to the main square, Patio des Escolas. 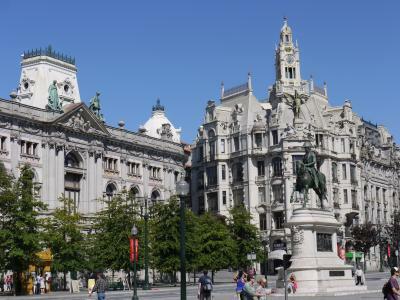 It has gorgeous buildings on three sides, and opens to a great view over the river and the city on the fourth side. My first stop was the Biblioteca Joanina, built in the 18th century. It has three huge rooms filled with bookshelves on two floors, with every space filled with ancient leather-bound volumes dating back to the 14th century. On the lower floor, all shelves are protected with chicken wire; the upper-floor galleries are not. The rooms are violently baroque, with bulging gilded ornaments overflowing the top of the shelves. Triangular wooden columns with golden inlays hold up the gallery. Trompe l'œil paintings on the ceiling suggest more columns and an extra floor that isn't there. Quite overwhelming. Everybody whispered even though nobody has used this library to read a book in a very long time. 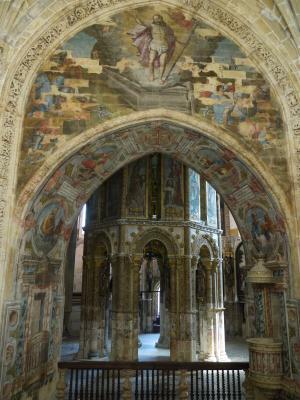 Next to the Biblioteca is the Capela de São Miguel, with an ornately painted ceiling. Just past the entrance on the right wall is an organ, with pipes sticking out in every direction, that looks like a huge bloated barnacle stuck to the wall, all gilded with more baroque ornaments. The rest of the chapel is less ornate. Past the Capela is the Museo Acadêmico, whose centerpiece is a large hall that is still used to award degrees. Blackened oil paintings adorn the walls. The ornate tiled curved ceiling framed by golden ropes is sadly sagging a little. 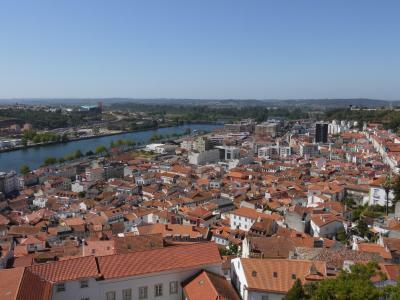 There is a fantastic view of the river and the city from a gallery halfway around the building, probably the highest viewpoint to be had in Coimbra. I spent the remainder of the afternoon and evening walking in the historic downtown at the bottom of the hill, on the other side of Rua Ferreira Borges. It's very charming, very old, and has successfully resisted modern architecture that infests so many other city centers. There are numerous little restaurants and cafes hidden in the narrow alleys. There is another string of restaurants at the edge of the river south of downtown. I also crossed the Ponte de Santa Clara, but there isn't much to see on the other side - other than a view of the university hill from across the river; the rising buildings look like a layer cake from there. The bus to Porto takes about 90 minutes, and the countryside has a lot more forests than before. 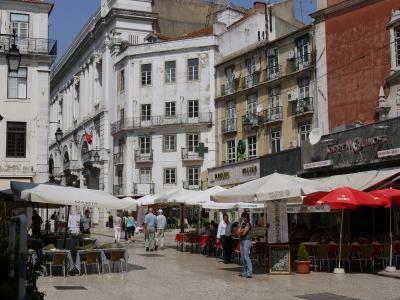 From the terminal it was an easy walk to the Residencial dos Alidos hotel near Praça Géneral Humberto Delgado, a very long square lined by grand old baroque buildings and faced by city hall. The hotel's top-floor rooms are small but all have doors to a large shared patio with a view of the city hall's ornate clock tower. Porto's old town is a Unesco world heritage. 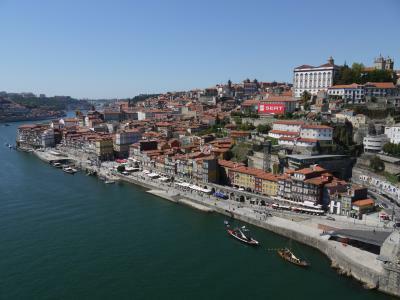 It fronts the Douro river, where many restaurants with English menus listing pizza and spaghetti wait for tourists. The view of the town rising up from the river would be beautiful if it weren't ruined by a giant red car commercial billboard. The alleys are not as twisty and confusing as in Óbidos and Coimbra. They are, however, frequently just as steep, and open onto piazzas with great views over the city, the river, and the bridges spanning the river high above the water - the hills on both sides of the river rise to some 100 meters. The main cathedral is simply called Sé. 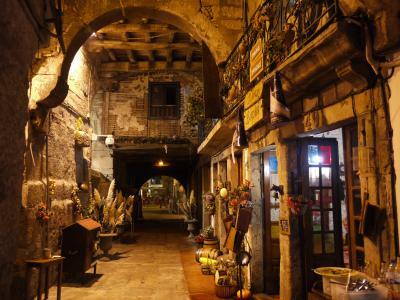 It has the usual pretty courtyard with arcades, a large sacristy full of antique furniture, and several museum rooms. They have little machines with an array of electric candles on top, and you can light a candle by dropping in a ten cent coin. 20 cents light two candles, 50 cent four, and one euro eight candles. There is probably a deep meaning here that only catholics understand. The cathedral is not quite as scenic as the one in Coimbra though. And like Coimbra, and unlike Óbidos, the city doesn't end at the edge of the old town but sprawls a long way from the center. 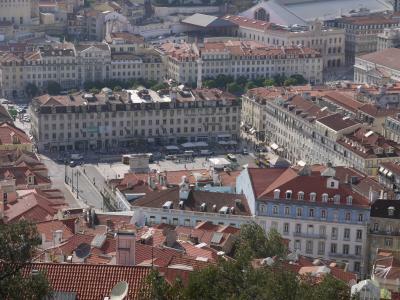 Porto has a population of 270,000. 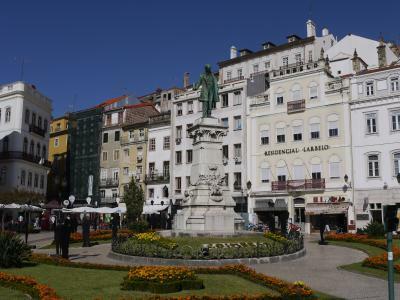 North of the old town centers on the Praça Géneral Humberto Delgado. The streets here are mostly straight and level, sometimes pedestrianized, and lined with mostly historical buildings. There are few modern buildings. If Porto didn't have the world heritage old town, this would perfectly pass as an old town too. In the side streets there is sometimes an air of decay, which makes for charming pictures but I am not sure I'd want to live there. There is much more car traffic than in the old town. Pedestrians wishing to cross a street at an intersection need to press a button, and then wait until the light changes. Of course nobody does that so everyone walks on red. I don't know why they have pedestrian lights in the first place. Some city planners ought to be fired. 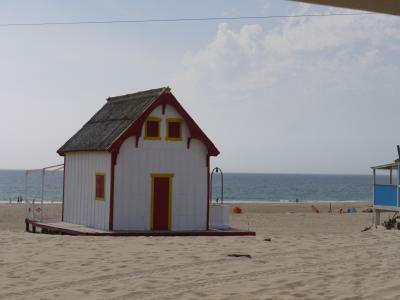 Vila do Conde is a beach town north of Porto. The red metro line takes an hour to get there. The old town is quite small and a little scattered. The enormous convent on top of a hill overlooks the old town. A long aqueduct used to supply the convent with water; quite a lot of it is still standing. 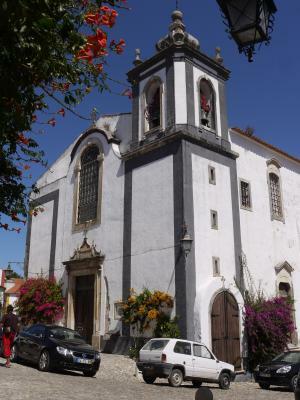 On the northern end of town is the Igreja Matriz church, filled with a large altar and many gilded shrines. It was a Sunday, and they had a choir going and were getting ready for mass. There were over a hundred people in attendance; Portugal is a catholic country and gods are still a big thing there. South of the old town, nondescript suburbs follow the coastline of the Atlantic ocean for a long distance. Everything looks like it was built in the last 50 years without too much enthusiasm. 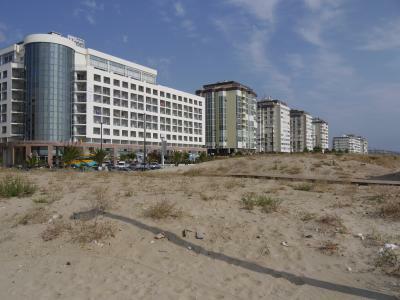 There are a few cafes, but at least none of the beachwear and surf shops that blight so many other beach promenades. It's all very low-key. The beach is very long, and partially sandy and partially rocky, with a lot of kelp laying about. Families were playing in the shallow surf, but it's not a place for which you would travel far on a vacation. 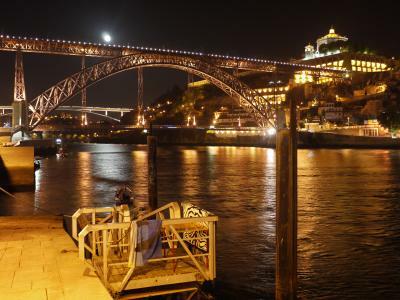 Back in Porto, I crossed the Rio Douro to the southern side by the central Ponte de Dom Luís bridge, using the upper deck which is reserved for trams and pedestrians. The view from up there is excellent. On both ends of the bridge, the town descends steeply to the river. On the northern side, a short section of the old city wall remains, and an elevator cabin runs up the side. 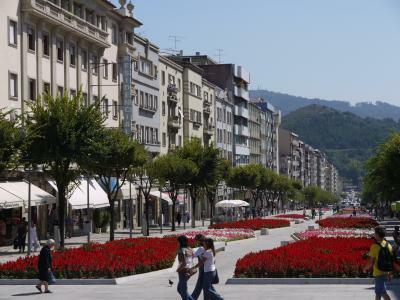 On the southern side, the town seems to be older and less well maintained, but the river shore is new and shiny and caters mainly to tourists. Local boys jump into the water from the piers. Back in April I was complaining about the Chinese habit of putting white bathroom tiles on the outside of buildings. They do that in Portugal too, but here the tiles form huge intricate hand-painted murals that cover entire facades of churches and public buildings, and they are very well preserved and not crumbling like in China. Quite impressive. 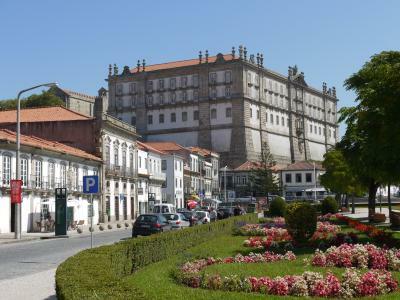 An hour on the bus brought me to from Porto to Braga in Portugal's northernmost province, Minho. 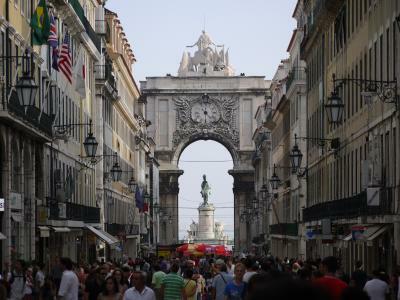 The city is very old - the Romans came here in 250 BC, and it played a central role in the Christian history of Portugal. 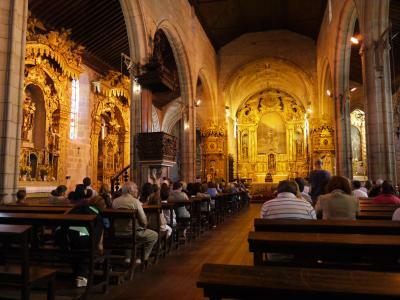 The main cathedral, Sé, was built in the 11th century, and a short distance down the road is the Santa Zita pilgrim's lodge in a beautiful old building. They don't even have a sign outside. I had reserved a room there, it's a Lonely Planet "our pick" recommendation. My room was large, with wooden floors and a modern bathroom, for an extremely low price. I even had a crucifix over my bed. 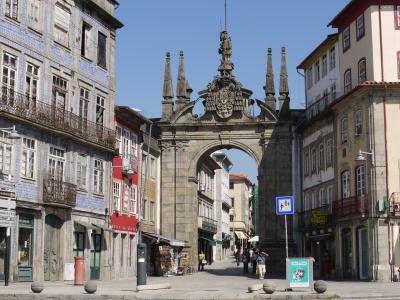 Braga has a historic downtown, although it's not quite free of 20th-century architectural warts. 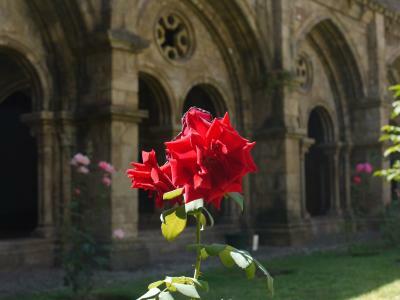 Braga feels like a city where people enjoy living, strolling the ancient pedestrianized streets, enjoying the little parks full of flowers and fountains, sitting in one of the numerous sidewalk cafes, and not getting hung up over the fact that the place is thousands of years old. This is not a tourist mecca like Porto where fast food restaurants with menus in four languages line up on the main promenade. But it's very pleasant to walk the streets and visit the cathedrals, museums, and palaces scattered around town. Unlike places like Rome, everything is in walking distance in the old town. Further out Braga becomes a very unattractive modern town with mindless rows of concrete buildings and heavy traffic. Taperia Palatu, a Spanish/Portuguese restaurant in the old town, is another Lonely Planet recommendation. The gambas tapas was incredible, the best I ever had, better than in Barcelona. Except that "tapas" here doesn't mean many small appetizers in little earthen dishes - this was a regular plate with a large pile of jumbo shrimps. I could barely finish. A young waiter there spoke English and gave recommendations. People in Portugal usually don't speak English. Younger people often speak broken English, but when calling hotels to make reservations we used a strange mixture of English, French, and Italian words. "Bom Dia, una camera singola por favor, tomorrow around noon, ensuite, je m'appelle Thomash, obrigado" (in Portuguese, a trailing "s" is pronounced "sh"). I know from long experience that it's hopeless to explain the spelling of my last name in any language. In a country this hot, I would have expected better ice cream. What they sell here is mostly industrial products like Olà (elsewhere known as Langnese) and sometimes Nestlè. Even Gelaterias get their ice cream prepackaged in large metal containers sealed with plastic. But the bakeries here are very good. This time I used the train to get from Braga to Tomar, and I had to connect twice. The old town of Tomar is small, easy to walk, and stretches from a hill with a castle on top to the Rio Nabão river. All the sights are in the old town, plus a little park just across the river. Much of it was built in the 16th century, but it is not professionally ancient, it just happens to be very old but doesn't make a fuss about it. There are no acres of gilded stucco here, just neat little alleys with two- or three-story buildings. My hotel, the Residencial União, is half a block from the cathedral and the beautiful Praç de Republica plaza. Very cozy, but some rooms are better than others. People come to Tomar to see the castle. 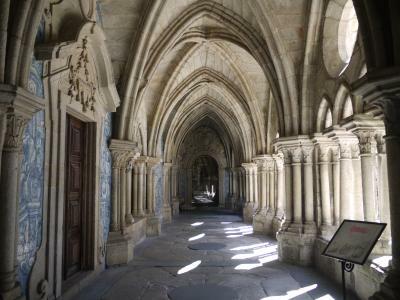 It was the HQ of the Knights Templar in Portugal, an enormously powerful and rich Christian order. It was begun in the 12th century, although much of it was added or replaced in the 16th. Some parts of it are in ruins, but most of it is perfectly preserved. So perfectly, in fact, that I wonder how much of it was repaired in modern times. The light switches and electric cables inside the walls, and the modern restrooms would seem to support the theory that not all is authentic here. And the place is huge - tourists get lost in courtyard after arcaded courtyard, several storys high, terraces, prayer rooms, spiral staircases, three wings of cavernous dormitories, kitchens, gardens, and a huge 16-sided church with a round altar towering in the middle. It just doesn't end, whenever I thought I had seen it all I'd stumble upon yet another courtyard or vaulted hall. I have been in the HQ of the Teutonic Knights in Malbork, now Poland, but that's just a gloomy old castle compared to the palace in Tomar. Unfortunately there is no furniture so it all looks a little bare. They have coin-operated computer displays for more information but I haven't seen anyone use one. The museum store mainly sells wine and jam. After the castle, I just didn't have much steam left for the museum circuit downtown (literally - the sun was burning hot, it must have been close to 40 degrees). The customary cathedral is quite nice, and it's still in use, people pray here. I also checked out the modern Tomar on the other side of the river, but it's very bland, there isn't much to see there. 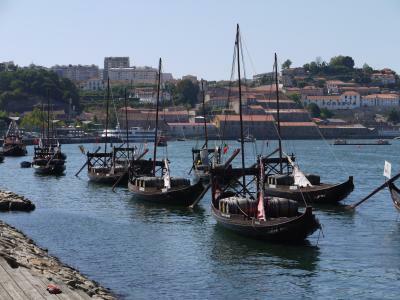 The original plan was to travel north along the coast to Porto, and then turn inland and return there. But Portugal doesn't work that way. To go from Tomar to my next destination, Évora, I had to go through Lisbon at the coast, more than twice the direct distance. Both the train and the bus schedules require this, except that the train leaves at 5:45 in the morning and takes six hours, and the bus leaves at 9:30 and takes four hours. Had to think hard about this choice. So I briefly saw the bus terminal in Lisbon again where this tour began. 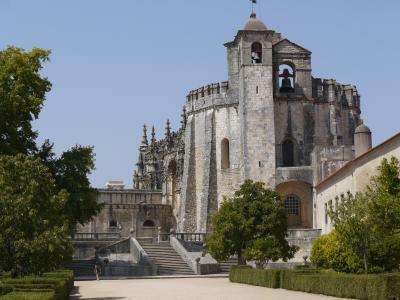 Évora is another walled old town built on a gently sloping hill, with the same whitewashed small houses, narrow cobblestone alleys, and impressive cathedrals. It's larger though, and even though the alleys are too narrow for cars people drive and park there anyway. It's very difficult to take a picture of Évora that doesn't make it look like a parking lot. As far as I can tell, only one short stretch of road between the main square, Praça Giraldo, and the cathedral is pedestrianized, more or less. 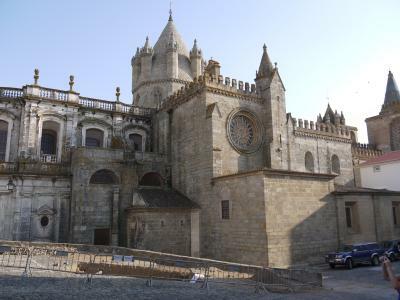 The cathedral follows the by now familiar layout: big church with dramatic gilded altars, and a cloister on one side with a garden enclosed in gothic arcades. There is a stairway to the roof, which has good views over the town and the surrounding countryside. 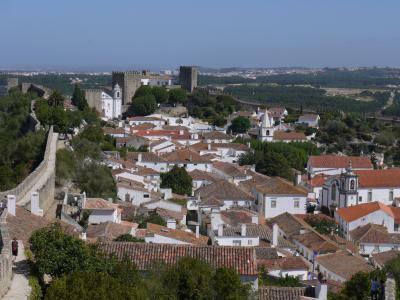 Unlike the other towns I had visited after Óbidos, there was very little sprawl and not much of a modern town outside the city walls. 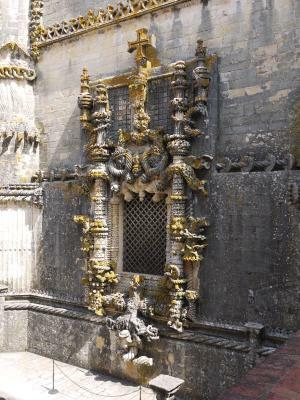 They also have a museum with lots of ornate gowns and reliquaries encrusted with jewels. The largest holds a piece of the True Cross, the one Jesus got nailed to; these pieces are found in many catholic churches and combined would suffice for a dozen crosses. But who am I to doubt the veracity of these claims. Outside the church they have a little Roman temple, or more accurately three walls of Corinthian columns. They are very well preserved because they were hidden in the walls of a later building, and discovered only a hundred years ago. Nearby they also found the remains of a Roman bath in the basement of the city hall. Amazing what you find if you clean up your basement. The Roman bath has free Internet PCs with LCD displays that date back almost to the Romans. Finally, I saw the ossuary in the cloyster [sic] of the Igreja de São Francisco church. 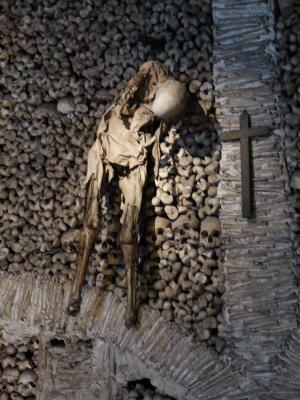 This is a large hall completely wallpapered with human bones and skulls. The arches of the vaulted ceiling are lovingly lined with skulls too, and they have two corpses hanging off the ceiling. Charming. The first century or so the smell must have been very distinctive, but after 500 years it's ok. I was getting the feeling that the towns I had been visiting after Porto were all different, but in a way all variations of a common theme. So my next stop was going to be at the Algarve, Portugal's southern coast and primary tourist destination. The lady at my chosen hotel in Tavira didn't understand English so I spoke French, and she repeated everything in halting English. I think we were in agreement. In any case, September is supposed to be the end of the high season in Portugal, and it was very warm and sunny, yet I always got the first room I checked and the hotels never seemed to be more than half full. Good timing. Of course, since I value atmosphere over amenities, I always booked into small pensions and B&B's, not into large modern hotels where the package tourists go. The only bus from Évora to Tavira leaves in the afternoon, so I went to Faro instead, the Algarve's capital and close to Tavira. It's an express bus but it keeps stopping at various villages, taking a long time to navigate the narrow streets, so it takes four hours. From Faro to Tavira is quick. After reaching the coast at Albufeira, I could see the damage done by cheap mass tourism: rows of identical hotels that look like converted parking garages run all the way to the beach, everything is choked by traffic, and the Portuguese charm is completely gone. I might as well spend my vacation on a supermarket parking lot. That's why I had chosen Tavira. 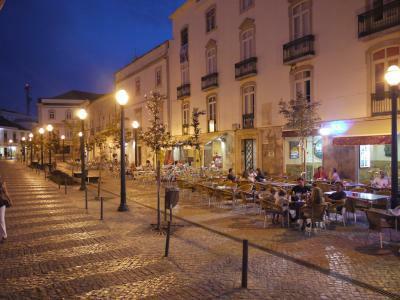 It has a pleasant old downtown with numerous sidewalk cafes and restaurants, on both sides of the Rio Gilão river. In fact, some of the narrow alleys are so packed with endless strings of sidewalk cafes that it's difficult to walk there. There is traffic, but much less than in Évora. I also went down the coast to Cacela Velha, a sleepy little cluster of old whitewashed houses, a church, and a small fort, in the middle of dunes and beaches. "Beach" is a bit of an euphemism though; down at the water it's muddy and further up the sand is coarse and there are many spiky plants and cacti. Nobody goes here for sunbathing or swimming. 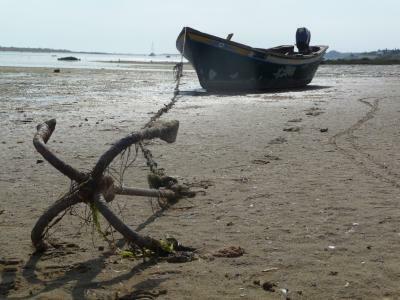 A few fishing boats are anchored at the beach. Very tranquil and relaxing. Unfortunately the bus goes here only once per hour. 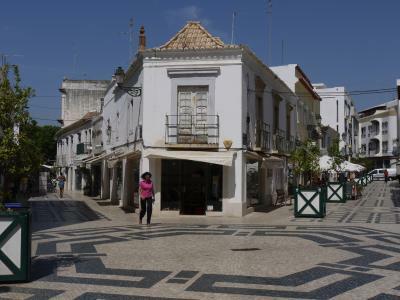 I left Tavira in the morning to see Faro, the capital of the Algarve. I didn't expect much since Faro is a large modern city and the Algarve's transportation hub. 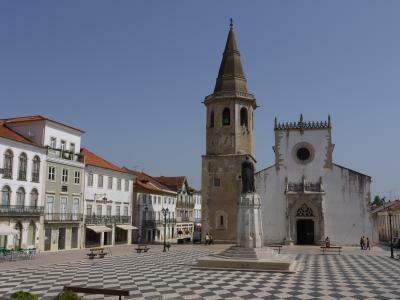 But although modernity encroaches on the city, the old downtown turned out to be quite pleasant: there is a small walled medieval town, Cidade Velha, on a low hill with the inevitable cathedral, complete with an arcade garden courtyard and a museum with vestments and jeweled religious tools. Some of them contain arm bones of saints, lovingly mounted in elaborate silver containers with a glass window so you can see the bone, and plaster crash test dummy hands on top. It has to be seen to be believed. Although I didn't visit the ossuary elsewhere in town, they at least had an elaborate open shrine covered with human bones and skulls. Most of the skulls were smashed open. I met Jesus in the men's room, he was a little green in the face and said that if he'd known this, he'd have given up the messiah business to become a carpenter or something. I might have been imagining this last bit, all this catholic voodoo is getting at me. I also climbed the cathedral's bell tower; very nice views. My stay in Faro was longer than planned because I had stored my bag at the bus terminal, and the storage place closes from 13:00 to 15:00. Nothing else does, the buses keep going, and so does the cafeteria, ticketing counters, and everything else. Some moron just decided to create this black hole for no good reason in the terminal schedule where bags are trapped. 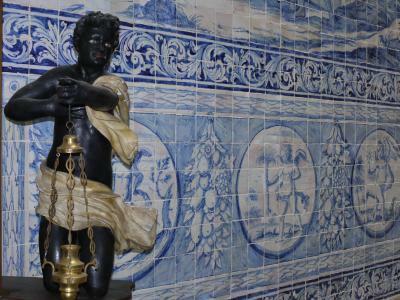 On the other hand, it was absolutely no problem to have my ticket rebooked, and I could spend more time exploring Faro. I had no urgent plans but if I had had to catch a plane I might have been a little irritated. My next stop was Albufeira. I knew it would be nasty but I felt I should see the ugly side of the Algarve too. Albufeira is a package tourist hell, a strung-out highway with a chain of cheap concrete tourist hotels on the shore side, and a strip mall on the other side of the kind the Americans are so fond of, complete with fast-food courts and big parking lots. The thought of spending a vacation there is horrible. Abandon all hope ye who enter Albufeira. 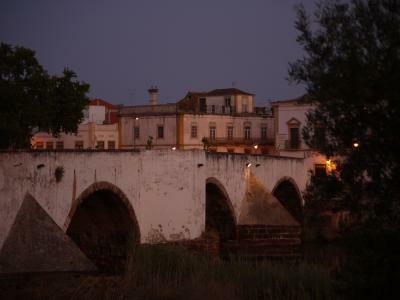 I left this holiday purgatory for Silves, where I had reserved a room at the Residencial Restaurante Ponte Romana, located scenically at an old Roman bridge over Rio Arade across from the center of the town. Silves is an old sleepy village, with many narrow pedestrianized alleys with sidewalk cafes, the inevitable hill with the inevitable cathedral and the inevitable little fort on top. It gave me back my faith in the serene beauty of Portugal after escaping Albufeira. One nice thing about Silves is that there is a direct express bus to Lisbon. After a little more time exploring Silves in the morning, I got on the bus and went back to Lisbon in the early afternoon, and checked back into my old hotel in the Bairro Alto district. I spent the afternoon walking, mostly in the Alfama district. 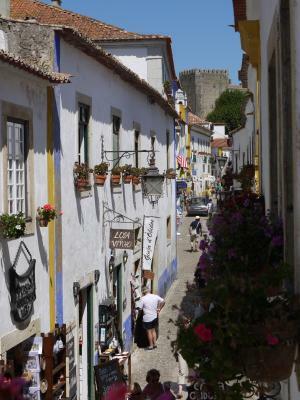 Alfama is a maze of twisty little passages, often quite steep or stairways. Alfama is a leftover of Roman and Moorish times of Lisbon. Children play soccer, mothers put the laundry out on the street to dry, dogs sleep in entrances, and tram #28 winds up and down the hill. 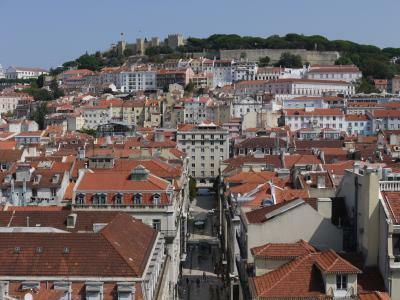 In some places, the maze opens up onto a terrace with great vistas over Alfama and the sea. Alfama is too steep for much car traffic. Silves falls asleep at 19:00. That's when Alfama wakes up. Restaurants open, their owners calling out to unsure diners; the shiny cobblestones reflect the light from countless lamps, Fado music is played, and the alleys fill with people. 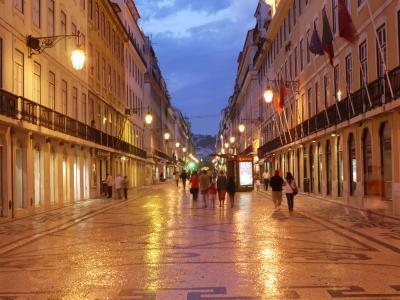 It's not unlike the Bairro Alto where my hotel is, but Bairro Alto is more orderly, the streets follow a grid there. 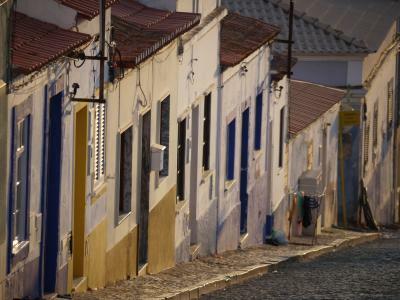 No two streets in Alfama are parallel, and none are even straight for more than a block. Lisbon's beach is not in Lisboa but on the other side of the Rio Tejo, at the Atlantic coast. The village there is named Costa da Caparica, and it's basically a more relaxed version of Albufeira - lots of modern development at the northern end of the beach, but they still have little streets there instead of highways and strip malls. But I doubt many people come here for the town, and the beach extends south for eight kilometers. And it's a proper beach - no road except at the north end, dunes, a wide beach, and the sea. At the end of the developed northern section, there is a little narrow-gauge railway that carries people between the beach sections, numbered 1 to 20. It's really one long stretch of sand though. I know that some people pick a beach for their vacation and then stay there for two weeks, pitching their umbrella and towels, lathering up with sunscreen, and bake motionless in the sun. I never understood that but I made a valiant effort to find out. I brought a towel, bathing trunks, and a book. The sand was clean and fine, the water was warm, there was mild surf, but it got boring very quickly. I think it was the book, I shouldn't have brought it. People never read on beaches. Someone should do a study whether people who enjoy such a mind-numbingly boring non-activity for weeks at a time can, in fact, read. There were only a few joggers at the edge of the water but almost no other people sunbathing, I basically had half a kilometer of beach to myself. It was quite warm but maybe Lisboans find the temperatures in mid-September too chilly. Sintra is a small village west of Lisbon. A train between Lisboa and Sintra every ten minutes and takes 40 minutes. The village is very small and pleasant, and is centered on the Palácio Nacional, a museum with two odd-looking large conical chimneys. But I wanted to see the nearby hill. 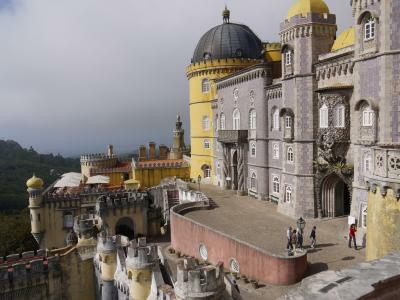 Palácio Nacional da Pena is a fairytale castle on top of the mountain, like a Moorish version of mad king Ludwig's Neuschwanstein. It is a wildly extravagant multicolored palace with curved ramps, courtyards, balconies, arches, columns, and innumerable turrets and terraces, in a wild mixture of styles and ornamentation. It's probably the most attractive place I have seen during my visit to Portugal. What makes it so attractive that the interior, with all the furniture, is either preserved or restored. In other palaces you see bare walls, or even crumbling brickwork, but here it's exactly as the royals who lived here left it. I especially liked the royal apartments at the beginning of then tour. They look cozy, like your grandmother's house (if your grandmother had unlimited funds). The rooms are not large but beautifully appointed, with well-preserved furniture and packed with collectibles like chinaware, silver, writing tools, pictures, chamber pots, and little statues. Many of the walls are painted; one is painted to look wood-paneled, and the Arab room has trompe l'œil ornaments painted on the wall that looks son convincing that one has to come quite close to see that it's not stucco relief. The artist was a master of light and shadow, even the position of the window was taken into account to cast fake shadows from the nonexisting relief. Amazing. They also had a wall-sized wooden telephone. After the charming royal apartments there are some reception rooms that are more pompous. While I was visiting the place I was imagining what the rooms would look like if they had been as poorly preserved as so many other castles - gloomy rough brick vaults with insufficient light, no doubt. A little down the hill are the roofless ruins of the Igreja de São Pedro de Canaferrim church. The info sign (everything here is signed in English) says that the church was altered into a romantic ruin by king Fernando II. I love their diction: "nice church you have here, let's alter it into a romantic ruin". There is a smell of eucalyptus trees in the air, and they have a few Californian Douglas firs. 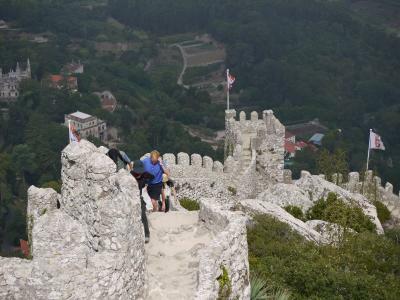 A few minutes further is the Castelo dos Mouros, a castle with an impressive defensive wall, the latest in medieval technology with curtain walls, bastions, towers, and crenellations. There isn't much to see but you can walk on top of the wall and climb on the towers all the way around. The views are great. They claim it's reminiscent of the Great Wall of China, but let me tell you, it's the Barbie dollhouse version of the Great Wall that I have seen on my visit to China in April. Back in Lisbon, I decided that I had no interest in working down the endless list of famous churches in my guidebook, and just walked Lisbon's charming old streets at random. 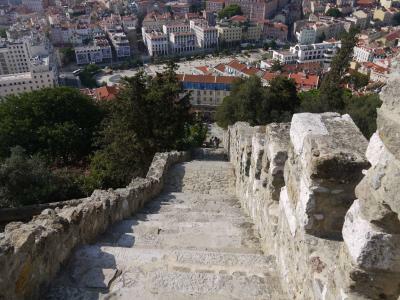 I went up to the Castelo de São Jorge, a walled little town where the modern world is - mostly - excluded; they have fort whose walls don't enclose very much space and a well-designed museum but not a whole lot to show. I also had to send some postcards and needed to buy stamps. The post office was empty, but when I walked up to a counter they couldn't help me, I had to walk back to the entrance and take a number. The display then slowly started to click up until my number came up - seems that the owners of these numbers had left in disgust - and I was sent to the wrong counter. So the same lady who had sent me away at first called me over and sold me two stamps. Bureaucracy is important. In Germany they are in the process of closing all post offices because email, stamp vending machines, and delivery robot stations have made the people redundant, and I expect that I can predict the future of the post office lady in Lisbon.